This issue occurs if you install an Office subscription on a PC that has pre-installed Microsoft Office desktop apps. Note: This issue is fixed in Office Version 1802 (Build 9029.2167) or higher. 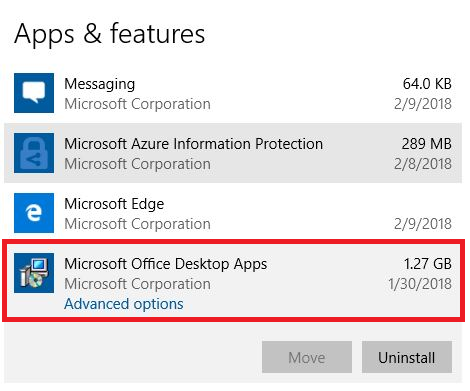 When you install an Office Subscription with that build or higher, it will automatically remove the pre-installed Microsoft Office Desktop apps. Right click the Windows Start button and click Settings. Click Apps, and then click Apps and Features. Choose Microsoft Office Desktop Apps and click Uninstall. Note: Before you edit the registry, we recommend that you make a back up of your registry. If a problem occurs, you can then restore the registry to its previous state. Learn more about How to back up and restore the registry in Windows. Press the Windows key + R to open a Run window. Press CTRL + F and enter 0006F03A-0000-0000-C000-000000000046 into the search box, then click Find Next. Delete the key by right-clicking on the entry and click Delete. Press F3 to repeat the search until no more registry keys are found.